Guardian Angels - My Catholic Life! Intuition is a fully formed way of thinking. It is more than just the occasional hunch or subtle perception. Native instinct, or “gut,” is used to calculate, discern, and decide on matters big and small throughout daily life. We think we are dryly logical about a decision to trust one accountant and not another, to frequent this store over that, or to confide in this new friend rather than that old one. But in reality it may just be a small stain on the accountant’s shirt collar that convinces us, perhaps unconsciously, that he is not the right man for the job. Squinty eyes, the grip of a handshake, a laugh, or the way someone holds open the door or sips their coffee. We pay very close attention to the slightest clues given off by fine nuances of facial gestures, body language, and tone of voice to draw immediate conclusions. We are not as coldly rational as we like to think. So when an atheist, a PhD in the rational discipline of statistics perhaps, walks alone down a remote country road in the dark and still of night and hears a long lost voice in the whistling wind, or sees in the tree branches a bony finger pointing at him, he grows frightened at his apparently irrational train of thought. But maybe he then suddenly turns around, totally convinced that he felt the breathy presence of someone hovering just over his shoulder, right behind him. The PhD’s sober rationality is worth nothing in this environment. This is a time for the throttle of feeling and intuition to be fully open, a time for the pores of the mind to absorb every ounce of reality that is present. The holy guardian angels are created spirits. God is an uncreated spirit. A man is a soul and body and is procreated by his parents, who participate in God’s creative act. Though we are part spirit and part matter, we can imagine what it would be like to be pure spirit. We close our eyes and imagine standing at the pinnacle of the Eiffel tower in Paris and suddenly we are there, gazing over the city of lights. The mind travels, the imagination soars, the soul reflects. It’s our body that keeps our feet planted in one place and time. But if mind, soul, and imagination were not so tethered, then we would zip around the universe like an angel, a pure spirit unleashed, held back by nothing. God created the angels like He created us, out of nothing. God’s will is creative in the strict sense of that word. “Let there be light,” He said, and there was light. His will brings things into creation and maintains them there. God created the angels to communicate His messages, to protect mankind, and to engage in spiritual battle with fallen demon angels. The age-old tradition of the Church is that every Christian, and perhaps every human being, has an angel guardian protecting him from physical and spiritual harm. Christ warned, “See that you despise not one of these little ones: for I say to you, that their angels in heaven always see the face of my Father who is in heaven” (Matthew 18:10). An angel was at Christ’s side in the garden of Gethsemane, and an angel delivered Saint Peter from prison. The Fathers of the early Church wrote prolifically about the dense world of the spirit inhabited by angels. The Catechism of the Catholic Church notes that the angels belong to Christ. “They are his angels” (CCC #331). The Catechism also quotes Saint Basil, “Beside each believer stands an angel as protector and shepherd leading him to life” (CCC #336). We intuit that the world was made for more than just us. Some scan the skies for alien ships in low earth orbit. Others listen for strange patterns of speech transmitted like radio signals through the cosmos. Is there life on Mars? Are there extraterrestrial colonies behind the sun? There is no need to search so far, to seek life in the cold blackness of space. There are spirits all around us. Our Guardian Angels are present and accounted for, right behind us, at God’s command to serve and protect. Holy Guardian Angels, we implore your continued vigilance over our lives. Keep us from physical and spiritual harm, increase our trust in your presence, and remind us to turn to you when our well-being is threatened in any way. Who are Angels? – Nine Choirs – Who are Guardian Angels? 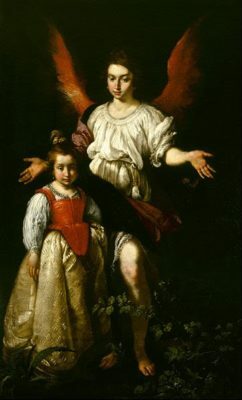 That every individual soul has a guardian angel has never been defined by the Church, and is, consequently, not an article of faith; but it is the “mind of the Church”, as St. Jerome expressed it: “how great the dignity of the soul, since each one has from his birth an angel commissioned to guard it.” (Comm. in Matt., xviii, lib. II). In the Bible this doctrine is clearly discernible and its development is well marked. In Genesis 28-29, angels not only act as the executors of God’s wrath against the cities of the plain, but they deliver Lot from danger; in Exodus 12-13, an angel is the appointed leader of the host of Israel, and in 32:34, God says to Moses: “my angel shall go before thee.” At a much later period we have the story of Tobias, which might serve for a commentary on the words of Psalm 90:11: “For he hath given his angels charge over thee; to keep thee in all thy ways.” (Cf. Psalm 33:8 and 34:5.) Lastly, in Daniel 10 angels are entrusted with the care of particular districts; one is called “prince of the kingdom of the Persians”, and Michael is termed “one of the chief princes”; cf. Deuteronomy 32:8 (Septuagint); and Ecclesiasticus 17:17 (Septuagint). This sums up the Old Testament doctrine on the point; it is clear that the Old Testament conceived of God’s angels as His ministers who carried out his behests, and who were at times given special commissions, regarding men and mundane affairs. There is no special teaching; the doctrine is rather taken for granted than expressly laid down; cf. II Machabees 3:25; 10:29; 11:6; 15:23. But in the New Testament the doctrine is stated with greater precision. Angels are everywhere the intermediaries between God and man; and Christ set a seal upon the Old Testament teaching: “See that you despise not one of these little ones: for I say to you, that their angels in heaven always see the face of my Father who is in heaven.” (Matthew 18:10). A twofold aspect of the doctrine is here put before us: even little children have guardian angels, and these same angels lose not the vision of God by the fact that they have a mission to fulfil on earth. Without dwelling on the various passages in the New Testament where the doctrine of guardian angels is suggested, it may suffice to mention the angel who succoured Christ in the garden, and the angel who delivered St. Peter from prison. Hebrews 1:14 puts the doctrine in its clearest light: “Are they not all ministering spirits, sent to minister for them, who shall receive the inheritance of salvation?” This is the function of the guardian angels; they are to lead us, if we wish it, to the Kingdom of Heaven. St. Thomas teaches us (Summa Theologica I:113:4) that only the lowest orders of angels are sent to men, and consequently that they alone are our guardians, though Scotus and Durandus would rather say that any of the members of the angelic host may be sent to execute the Divine commands. Not only the baptized, but every soul that cometh into the world receives a guardian spirit; St. Basil, however (Homily on Psalm 43), and possibly St. Chrysostom (Homily 3 on Colossians) would hold that only Christians were so privileged. Our guardian angels can act upon our senses (I:111:4) and upon our imaginations (I:111:3) — not, however, upon our wills, except “per modum suadentis”, viz. by working on our intellect, and thus upon our will, through the senses and the imagination. (I:106:2; and I:111:2). Finally, they are not separated from us after death, but remain with us in heaven, not, however, to help us attain salvation, but “ad aliquam illustrationem” (I:108:7, ad 3am).